Description: A short 4-car train makes its way through the rural Chaintown area, not far from Creek Hills. It is headed west from Connellsvile to Rook. Description: The rear helper on a short 3-car train waiting for clearance to get onto the CSX line in Connellsville. Note the materials sitting on the bridge walkway. These tracks are getting maintenance soon. On the other end of the train is W&LE 304. Description: The rear helper on a short train waiting for clearance to get onto CSX. The waterway under the bridge is Mountz Creek. On a rather cloudy day, luckily the sun appeared for this shot or it would have came out terrible. Description: The rear helper on a short 3-car train headed to the Connellsville CSX Yard. Downtown is in the distance. Description: The rear helper on a short 3-car train waiting for clearance to get onto the CSX line in Connellsville. Description: A short train of four PDRR boxcars leaves the Connellsville CSX Yard, headed westbound here but will eventually head northbound after interchanging with the W&LEs own track on the North End of Connellsville. Seen across the Youghiogheny River. Description: I photographed this same pair of engines in Connellsville before but the sun wasnt shining so it didnt come out like this one did. Here they are headed eastbound on CSX tracks to go to the Connellsville Yard. Description: Still looking shiny yet. This was in Rio Grande paint until spring 2011 when it was in an accident and the damage was deemed bad enough to warrant a full repaint. This engine was built as PC 3153 GP40 in September 1968. Later became Conrail 3153, DRGW 3153, and DRGW 3142. 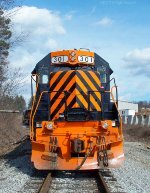 Seen here at the interchange with CSX in Connellsville, awaiting a new crew and not running. Description: On a short three car freight train at milepost one in Connellsville. This was the trailing engine. The train was waiting for a crew to head back to Rook Yard. This EMD GP40-3 was built as PC 3153 GP40 in September 1968. Later became Conrail 3153, DRGW 3153, and DRGW 3142. The weather was indeed as nice as it looks. 62 degrees in the middle of winter. Description: Two matching EMD GP40-3s on an 18 car freight train facing west, waiting for a new crew at milepost one in Connellsville. Description: Two matching EMD GP40-3s on an 18 car freight train heading west in Upper Tyrone Township, Pa. Approaching Bellview Road crossing. Description: Two matching EMD GP40-3's on an 18 car freight train heading west past Eannotti Road in Owensdale, Pa. Description: Two matching EMD GP40-3s on an 18 car freight train heading west through Creek Hills/Chaintown Pa. The train was going too fast at this point to follow it any further. With all of the new trackwork they have done, it has really improved train speeds. Description: Five locomotives consisting of AVR 4003, WE 301, WE 303, AVR 3001, AVR 3003 are waiting in Everson for a coal/freight train to be added on. The tracks are of the SWP Railroad. Description: This great looking GP40-3 is part of a lineup of five locomotives waiting for a coal/freight train to be added on in Everson. This was in Rio Grande paint until spring 2011 when it was in an accident and the damage was deemed bad enough to warrant a full repaint. This engine was built as PC 3153 GP40 in September 1968. Later became Conrail 3153, DRGW 3153, and DRGW 3142. Description: Train Z564-17 is idling here at mile 1 on the W&LE line, on another beautiful November day. It had only two steel coil cars for freight. #301 was built as PC 3153 GP40 in September 1968. Later became Conrail 3153, DRGW 3153, and DRGW 3142. It was repainted in 2011 after an accident. Description: Train 615 leaving Connellsville with a good number of tank cars that were picked up out of the CSX Yard. The train came the night before and got a new crew to leave today. This a very rare movement to see in daylight.